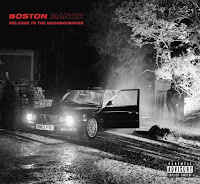 Home / boston manor / reviews / Review || Boston Manor - "Welcome To The Neighbourhood"
Review || Boston Manor - "Welcome To The Neighbourhood"
Boston Manor, a modern pop punk band from Blackpool in the UK, released their sophomore album titled "Welcome to the Neighbourhood" through Pure Noise Records on September 7th of 2018. My acquaintance with Boston Manor was coincidental and a thing of perfect timing. It was around the period where I had been seriously delving into what modern pop punk meant in 2015 and Pure Noise Records – the label which had just signed the band – was something like a flagship for that particular sound. "Saudade" – the band’s introductory four song EP on the new label – absolutely caught me off guard and blew my head away. It is understandable that a person can get more easily excited about something when it’s unexpected, but I gave the EP time and my enthusiasm was never curbed one little bit. The excitement and expectation of the band’s first LP Be Nothing was high and mostly met. In essence it is a continuation of the previous work. In that framework, I was anxious to see what - possibly different - the band had to offer with "Welcome to the Neighbourhood". Up to the release of "Be Nothing" in 2016, I would characterize Boston Manor as a very melancholic pop punk band with touches of a more alternative background and even a few heavier break outs. I call this "the British vibe", in comparison to a lot of American pop punk bands who address this kind of music completely differently. Just to be clear, I like almost all of it. With "Welcome to the Neighbourhood" the band keeps a core of its previous elements and shifts to a more popular sound. The entire record has sort of a slight 80’s electro-vibe that brings out the melancholy in Henry Cox’s voice and singing style perfectly. The production is now that of a “big” record, a more commercial one, something I personally always enjoy as much as discovering new approaches to music from the standpoint of a production. Out of the 13 total songs on "Welcome to the Neighbourhood", there are only a couple I would skip and this blend of quality and quantity establishes the record firmly in one of my favourites of the year. "Halo", "If I Can’t Have It Noone Can", "England is Dreaming", "Hate You", "Tunnel Vision" and the title track are THE hits of the record, but even most of the rest of the songs could easily be categorized as such; this is what a “big” record means. Originally enamoured with what Boston Manor brought to the pop punk table, I understand the logic behind "Welcome to the Neighbourhood". “It’s time to take what we have and bring it to another level”, is possibly the notion. I am totally on board.